This entry was posted on Thursday, November 24th, 2011 at 21:13 and is filed under Anti-Capitalists, Barack Obama, Business, Economics, Occupy Wall Street, Politics, Tea Party. 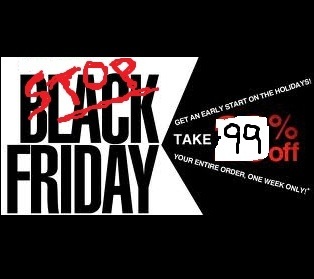 In an interesting development sure to finally put the lie to the notion that the Tea Party and the Occupy Wall Street crowds are similar, one Tea Party group has decided enough is enough with all the “Occupy” nonsense, and is planning to support stores by encouraging the public to shop like crazy on Friday in opposition to the “Occupy Black Friday” boycott aimed at publicly traded retail outlets. The Occu-pests don’t want you to buy from corporate America, but the truth is that they’re actually trying to stall economic recovery in order to foment revolution. It’s a maniacal plan, but it tells you a good deal about the motives of the two groups. The Occupiers want to use the economy for political purposes, and they wish to make it worse rather than better. Meanwhile, the Tea Party, largely a conservative-minded, guided by a generally pro-capitalist philosophy, is trying to help the economy recover. “At a time when our economy is most fragile and ratings agencies are talking about another downgrade of the U.S. credit rating, it’s completely irresponsible for Occupy Wall Street to attempt to bring the U.S. economy to a halt on the busiest shopping day of the year,” says Liberate organizer, John Sullivan, spokesman for the Cherry Hill Area Tea Party. Meanwhile, the Occupiers now intend to punish the economy. They are focusing on Malls and also on Corporations, claiming to make a distinction between small businesses and publicly traded firms, but the problem with this argument is two-fold: First, many of the shops and stores in any mall are small businesses. Second, corporations provide jobs to millions of Americans. What sort of lame-brain pretends otherwise? Black Friday often causes those retailers to spend more money on employees, hiring seasonal workers, and paying additional overtime to current employees, almost all of which is converted into spending in the economy. Particularly at this time of year, anything that boosts employment and wages in the private sector can only be considered a positive thing, unless you’re a ne’er-do-well Occu-Pest or leftist, and these anti-capitalists (despite their disingenuous claims to the contrary) are intentionally setting out to wreck the biggest shopping day of the year. There’s no doubt that we have a serious problem in the economy, and on Wall Street, but most of that problem originates from Government’s tinkering in the free market, and from grotesque cronyism. If the Occupiers want to make a real difference, they’d Boycott Obama. They’d help the Tea Party Occupy the White House. Unfortunately, they’re not that kind of movement, and their intentions are clearly anti-free market, anti-capitalist, and anti-liberty. I agree with the Tea Party organizers who wish to have a BUYcott tomorrow: Let us elevate ourselves without the government. If the government and their shills in the media intend to flat-line this economy, and they’ve cooked up the Occu-pests to help, I say we oppose them. I’m not ordinarily the sort to go Black Friday shopping, but tomorrow I will, because I believe in the free market, and I’m going to damned-well engage in it irrespective of, and in spite of the Occupiers, Obama, and all their miserable cronies. Quit buying into all the extremist propaganda. Occupy isn't about undermining capitalism or empowering the Obama administration, nor isn't solely a "Leftist" issue. We're living in a country where the middle class is going extinct and the super-wealthy are richer than they ever have been. It's about make corporate America and congress aware of the struggles of the vast majority who are struggling month to month to pay bills and support their families. Congress's incompetence and inability to solve problems regarding the debt ceiling is the reason for S&P's lowering of our AAA credit rating and the fault should in no way fall on the shoulders of the Occupiers. Furthermore, Republicans in congress are contributing to the gridlock more than anything (though I'll say that virtually every member of congress is corrupt these days) by adhering to their oath to never raise taxes which does nothing but exasperate the already volatile deficit problem. They hold themselves more accountable to corporate funded Lobbyists like Grover Norquist and special interest bribery than the people who elect them. All Occupy is asking is that congress take action and support the desires of their constituents rather than multi-billion dollar corporations. As to "extremist propaganda," I must say you seem consumed by it. I see the problem with the downgrade, and I have talked about it in other articles here. You say the super-wealthy are richer than they've ever been. I am by no means super-wealthy, and probably what would be called "firmly middle-class." What I notice is not that the wealthy pay too few taxes, but that we hand out far too many benefits to people for the simple fact of their existence and some confounded claim of "need." That isn't a valid claim upon my wealth. Your "need" isn't my problem. Neither is my need a claim upon Bill Gates' wealth. Nor is it the basis for a legitimate claim upon the government. You are an extreme lefty, and you don't even know it. Evidence website is making the round ! Your logic is twisted by propaganda and has no logic. Visit a tea party site and learn, baby, learn. Don'y try to argue, just learn. If it does not make sense to you after a few days, then go back to your dungeon of thieves. You will be amazed to see the contrast. Now, I am going shopping!